NARROW AISLE PALLET RACKING consists of Adjustable Pallet Racking but with rows installed closer together eliminating the wasted space of wide aisles. 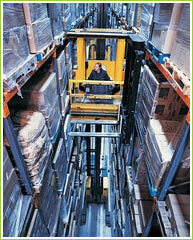 The pallets can be stored to a greater height to maximise the available headroom. The system is operated by special narrow aisle trucks, guided by floor-mounted rails or electronic wire guidance fitted in the floor.